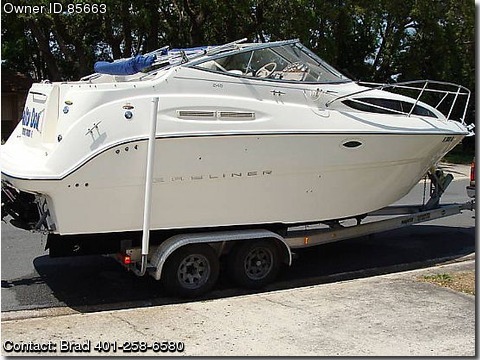 Bayliner Cierra 24' cruiser. 5.7 Liter Mercruiser w/ Bravo 3 outdrive (twin prop). Looks and runs like new, good on gas. Includes tandem wheel trailer, Garmin 182GPS chartplotter and many extras. Sleeps 4 comfortably, holds up to 12 people. (Brand new cost 60K w/out trailer). Have a like new boat for half the price ! Just needs to be cleaned for launch.Coast guard pack, Bravo III w/ 300hp Merc, 2 axle trailer. Must sell, just had a baby. Call Brad @ (401) 258-6580.Sister ship photos shown.